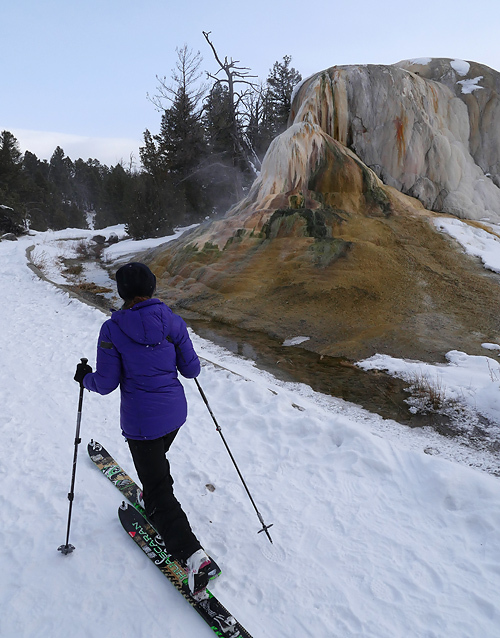 Located near the North Entrance to Yellowstone Park, Mammoth Hot Springs is an excellent location for custom guided backcountry ski trips. There is a great network of beginner and intermediate cross country skiing trails in this area, and the hot spring features are truly unique. Additionally for those that are interested, there are challenging and adventurous alpine touring options in the area as well. The Mammoth Hot Springs region is also winter range for bison, elk, wolves and other iconic Yellowstone wildlife. Please contact us for more information about guided ski trips in this wonderful area: ski.yellowstone@gmail.com, or call 406-855-7107.